Grooming to Get Your Dog Looking and Feeling Great! 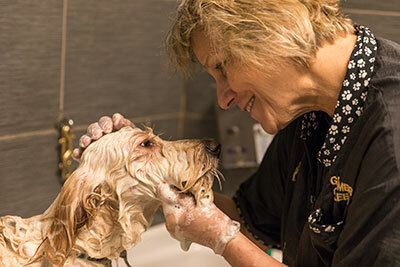 Treat your dog to a spa day at Pet Care Plus. Our experienced groomers will have your dog looking and smelling great be it a show cut, hand stripping or just a basic groom. All of our grooms include a deluxe bath using our special Hydrosurge bathing system to deliver your pet an invigorating massage which helps penetrate their coat to bring oxygen to the skin, leaving your pooch cleaner and healthier than ever. The best part is this can be done after a day of daycare or at the end of a boarding stay to send your dog home better than when they came in the door. A good grooming not only keeps your dog looking great but it is also an important part of their health care routine. Our expert groomers can not only give your dog any style you want but are trained to look for skin and coat conditions that could be an indicator to larger issues. Let us take the pain and hassle out of keeping your dog in tip top shape. Call today to book your appointment with the Chicago dog grooming experts at Pet Care Plus. All grooming prices depend on size, breed, style and coat/skin condition. We also have many upgrades and extras that can give your dog that spa day feeling. Our dog gets groomed at Pet Care Plus. The facility is clean and well maintained. My husband jokes that the groomer’s facilities are nicer than where he gets his hair cut. The staff we interact with are always incredibly pleasant. Our little guy is a puppy mill rescue and far from the easiest dog to groom. Our last groomer even recommended we sedate him beforehand. However, the groomers at Pet Care Plus just take extra time with him. He always looks fantastic after. I am also incredibly impressed that they don’t knick him given how much he moves around. Perhaps most amazing is how reasonably priced they are given all that they do. ~ Samantha O.